I love how authentic Allie's presence is in her videos. She gives down to earth, practical advice on spiritual topics. Give her a listen!! I enjoy Allie’s advice and her spiritual perspective. Highly recommend this podcast. The Podcast Is Back in Action !! Infinite gratitude for your fabulous work! Hi Allie! Just wanted to let you know I love your show. Today's episode really hit home. My red and yellow energies are a mess! You have given me a lot of food for thought. I hope this year is full of blessings for you! Allie is always there when I need her!!! Her podcast are awesome !! @ wired vibes you just don't know how out going & warm Allie can be. SO DON't JUDGE a person you know nothing about. Super great - I enjoy how real A keeps her podcast information and recordings. I appreciate the weekly tarot overview and her sense of humor! Thank you! Great podcast. Great information. When I started listening to it I didn't know much. It has opened up my mind. I always look forward to the podcast on sundays. Very good information, but what sets her apart from a lot of others in the metaphysical sphere is relateability. She doesn't cut out anything and pretend life is perfect, which in turn teaches us how to take things in stride. She's the awesome intuitive aunt everyone wishes they had. Allie is always so interesting and informative! So glad this podcast is back. Allie is SOOO Much Fun!!! She is quite a talker. Down to earth and lively. You go girl:::keep it up! I love Allie's podcast/blog/insight/advice/website/help. She's a joy to listen to and I think everyone should check her out!!! ....wrote the above a few years ago, and I still stand by it. LOVE YOU ALLIE!!! The first time I came across this podcast I was elated. I felt that what she said on that particular podcast was exactly what I needed to hear. From then on I have been a loyal listener. Allie is great at what she does, her insight is excellent, her advice is excellent and I'm happy that I have been able to be a part of the experience. Kesha A. Wonderful, up front, welcoming, to the point!! I just started downloading gypsy advice and once I started the first podcast I couldn't stop listening! She speaks out of honesty, ability, her connection to her guides, experience and clearly the desire to help others. She has said many things that have hit home for me, leaving me breathless for just a second, clarity dawning on me. I just submitted first email to her, and I look forward to getting some of her other readings done in the future! Allie is a very gifted intuitive. The info she gives you is specific and detailed, then structured in practical application. She isn't afraid to tell you the truth, which I very much appreciate. The podcasts, and her radio show, are enlightening and entertaining. I'm a client of about six months and totally hooked! Love Allie's podcast! She is very insightful and knows her stuff. Allie is very enjoyable to listen to, she has humor and knowledge. Everytime I listen to her show, I learn something new! I wish I could have a friend like her to talk to. I have had several readings from her( very reasonal prices)and what she has told me has happened, unbelievable!! !Give Allie a listen, you will not be disappointed. Luv your show. Thanks!! It's not only the consistency of the podcasts, but Allie's connection to her fans and willingness to reach out to all those that she is possibly able to that are asking for her help. She gives 100% of her energy all the time to her commitment. She is extraordinarily able to push through her own walls as a model and in the midst give not a rats a** what people think and personally she is just such an inspiration! Incredibly busy as a single mother, author, podcaster etc... but we always know she is there if we need her because her commitment is clear!! I recently found Allie's podcast and found that I now need to go back and listen to all the past ones! Listening to Allie is like meeting a girlfriend for your weekly coffee talk. She is honest and upfront with her readings and also very encouraging! Very informative! I really like that Allie is so down to earth. keep up the great work. Allie presents an enjoyable and genuine insight into a variety of spiritual topics. She's fun and easy to listen to. I've enjoyed listening to her for almost a year now and am delighted she shares her world with others. Is numerology accurate? Why do you believe in it? How did you get turned on to it? I look forward to every single one. Every. Single. One. So accurate and revealing, without being too shocking with spiritual revelations or anything. And any questions are well-answered. Allie is fun and entertaining, She is on-the-money with her advice and never boring! You wont regret giving her a listen-to. Ally always offers a healthy dose of blunt reality to all of life's little questions. She is by far one of the most gifted mediums I've had the pleasure of dealing with. Allie keeps my long drives to work fun and entertained with her funny & witty podcasts. At the same time, I'm always learning something new. 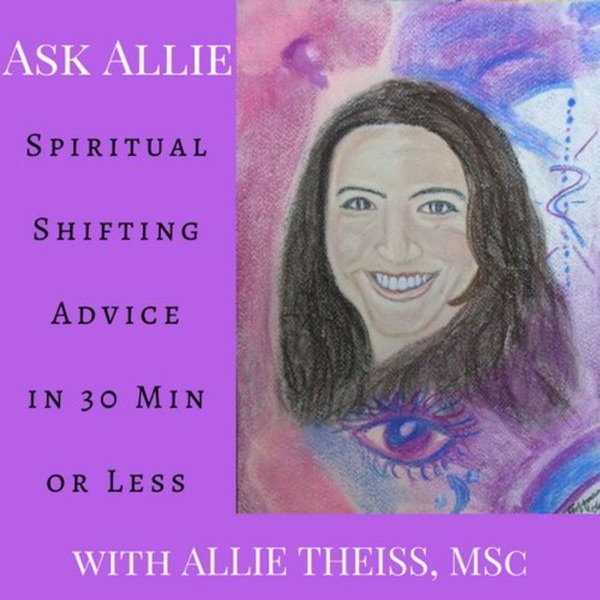 Allie's podcasts has helped opened up new areas of spirituality in my life and I'm very grateful to have found her. Thanks, Allie! I was told to listen to Allie by my sister and I have no regrets. She is helpful and informative and also has a human side, which I don't normally get to see when seeking spiritual/psychic assistance. Also, I absolutely adore the mp3 readings and suggest listeners with questions to try it if they have any pressing issues or concerns about their life. I did and it is currently helping decide what steps to take to make me happy. Two thumbs up! A breath of fresh air and good humor! I stumbled across Allie a while back and I almost want to think that I was "lead" to her! It's great being a single mother and a fellow podcaster to find someone that I can relate to in a lot of ways. i love allie's podcast...never a dull moment. she is full of insight and humor about deep, confusing subjects. she is helpful in all sorts of spiritual and soul concerns. rock on! Allie's loads of fun to listen to! one of the best pod casts out there very sootheing voice love it! gets you thinking! I love this advice! I really can not wait to hear what Allie will come up with. Honest and to the point! Allie is one of those people I connected to immediately. I admire her honesty and her candor in dealing with people. This lady doesn't hold back, but delivers hard truths with love and compassion. Her humor will keep you wondering what she'll come up with next. For me, her topics are very relateable, interesting and helped me realize that what I experience in my life is normal and sometimes she's the first person I've ever heard talk about things I'd been experiencing for years! She's brought light to situations and made me realize I wasn't heading for a padded room. Thanks, Allie! HEY ALLIE'S MY NAME TOO! This is a great podcast! And I recomend it to anyone! Oh! thats how I spell my name too, but I'm changing my name to Sylar because there are four other Allies at my school. (Plus I love Sylar from Heroes!) Finally I'm also psychic because I took this test on a medium website and it said I'm psychic... OK I'm gonna stop writing now I can sense who evers going to read this will think half of information is piontless OK then bye, and subribe! I enjoy Allie's podcast very much. I love this podcast, it isn't boring, works well at work. Was rec'd to me by my roommate, and I really enjoy listening to it. You will not be disappointed. I don't know what is wrong with Oprah but she should be on here giving Allie props and not bumping her down the chain. Ifyou listen to Allie you know that she is a wonderful guide for those of us who aren't always sure of what way we're going or what the signs are trying to tell us. I personally have heard some life altering things from her and can't imagine making my way thru my life without having her light to brighten those dark times. This is such a great gem-great podcast, lovely person. You must not miss this gem of a show. i love listening to askallie. i became a subscriber because i was drawn to her friendly nature and her loyalty to her podcasts. i enjoy listening to her once a week. i have now become a great fan. I've had a few readings done with Allie and she's just amazing. Go check her out if you haven't yet, you won't regret it! I've listened to ALL of the podcasts twice over. The best part of my day is on the commute to work, thanks to Allie's podcast!